Price: £4.49/£4.99 combo with drink. 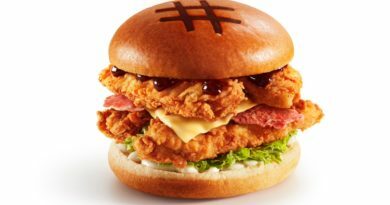 It’s finally here, one of KFC’s wackiest creations yet! Here actually means Salford and the other couple of test locations in Leeds and Newcastle. The rest of the UK will have to wait for a general release but if/when there is one, you’ll see it on BURGER LAD®. Once upon a time there was a song that went along the lines of “been around the world and I, I, I, I can’t find my baby”… well, no more looking, here it is. 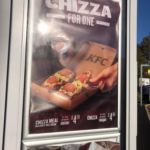 Seemingly making an appearance in every other country on the planet* (*exaggeration added for dramatic effect) it’s the KFC Chizza. What’s a Chizza I hear you all asking? Well, it is a chicken pizza hybrid. 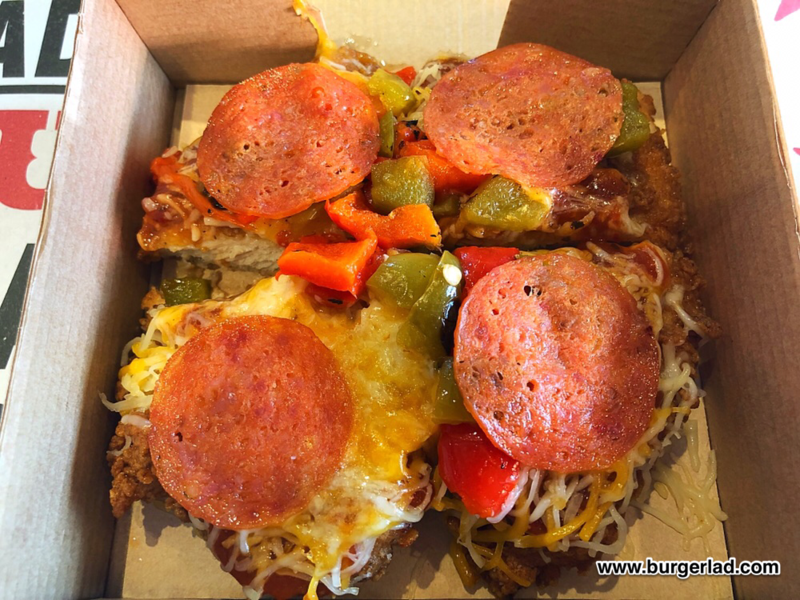 Specifically, a “pizza” where the base is made from fried chicken and the toppings are your standard pepperoni, red and green peppers, two-tone cheese and pizza sauce. 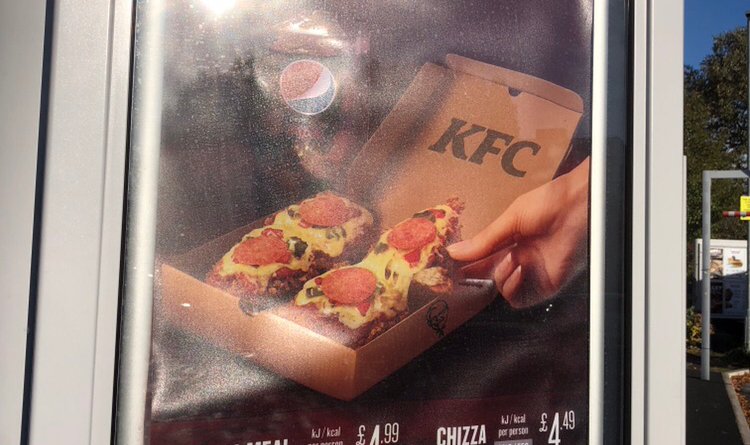 Smart KFC fans will have already read about the testing of Chizza in the UK – as reported here. And today, your favourite burger news and review website has evaluated it in advance of a UK-wide launch. 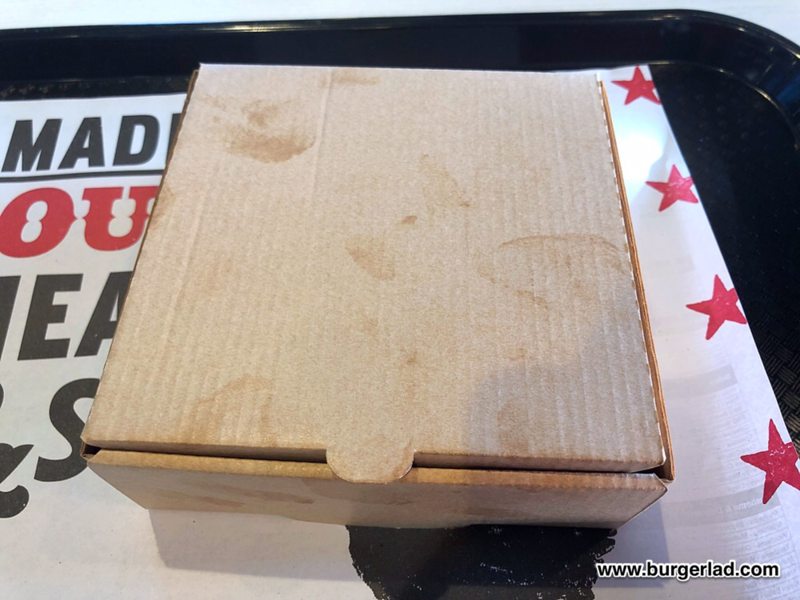 This infamous fast food item is available on its own or with a drink for 50p extra – no side, which is unconventional at KFC and could change in time. 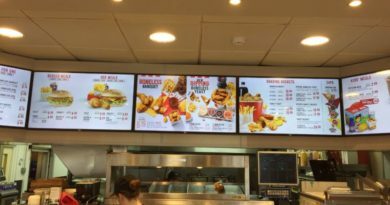 It has been given its own marketing shots for the external drive-thru boards and overhead digital display – both place it quite prominently. What it hasn’t been given is a branded box – mine arrived in a plain cardboard box which was considerably underwhelming. Yes, the box was like a mini pizza box but it didn’t even say KFC, let alone Chizza. I would anticipate this is just because it is a very limited test. It was still a pizza box, which was a good touch, as was cutting it into triangles. And what a moment? Here I am sat in a UK KFC eating CHIZZA. How long have we been waiting for this one…!? This is a rounded shaped piece of fried chicken (boneless, obviously) cut into four triangular quarters. All very small, although you can tell that from the listed 550 calorie count. The chicken “base” made it very much a deep pan style pizza. Each quarter had been given a slice of pepperoni, with green and red peppers and a pizza sauce making up the rest of the toppings. I wasn’t really sure if I was going to enjoy it and is clearly a bit messy to eat. 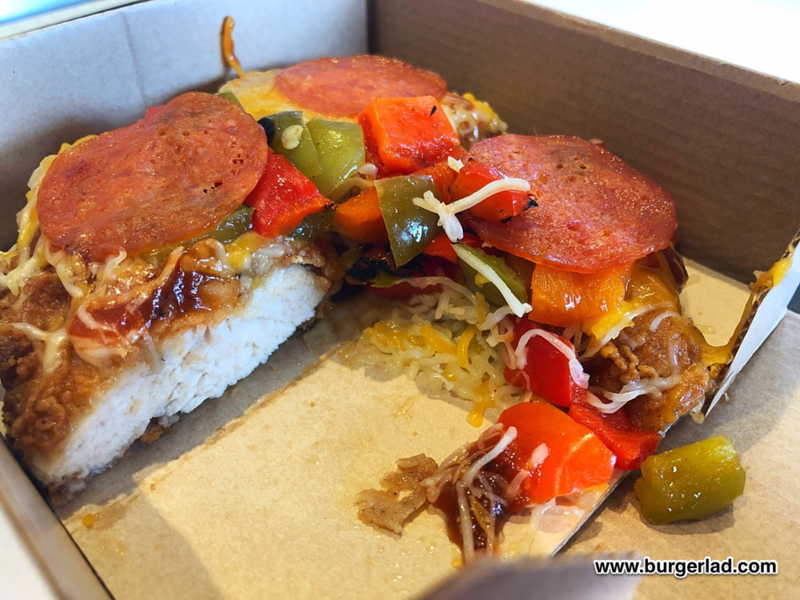 KFC’s Chizza is slightly strange, but good, and I do very much like the innovation. It’s fantastic to see a large high street chain unafraid to be brave and exciting – a gold star for KFC even before we get to the taste test. Biting into one of the quarters, it was distinctively, overwhelmingly pizza even more so than chicken. That pizza sauce is quite strong, and as a result we have a taste combination unseen before at KFC in the UK. All new stuff from the Colonel. It grew on me. 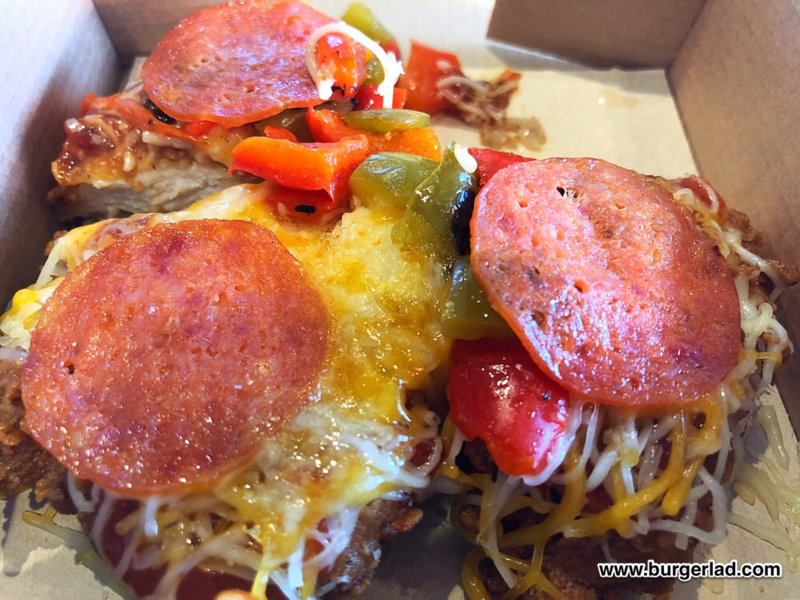 (IMO) It isn’t going to knock the Zinger off its perch nor do I think Domino’s or Papa John’s will be afraid, but it is a reasonable effort taste-wise. The pizza sauce overlaid everything so much that KFC’s secret blend of herbs and spices was neither here nor there. It was also very cheesy, which is a good thing. 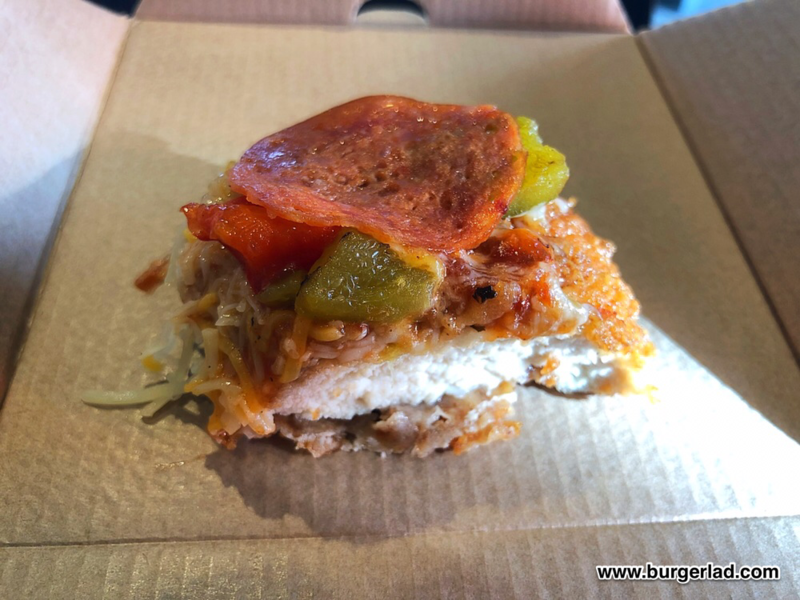 You get a touch of the pepperoni, and definitely the texture of the chicken in the base and the sensation is like you are eating a pizza of sorts. 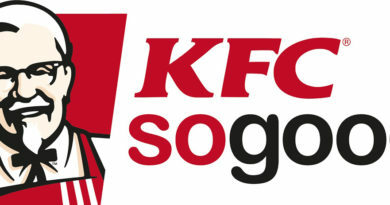 Overall, it is brilliant that it is in the UK (or coming) and to see one of the most-requested overseas menu items on the horizon is great for KFC fans in this country. Competitors now have the gauntlet laid down in terms of doing something a bit different. 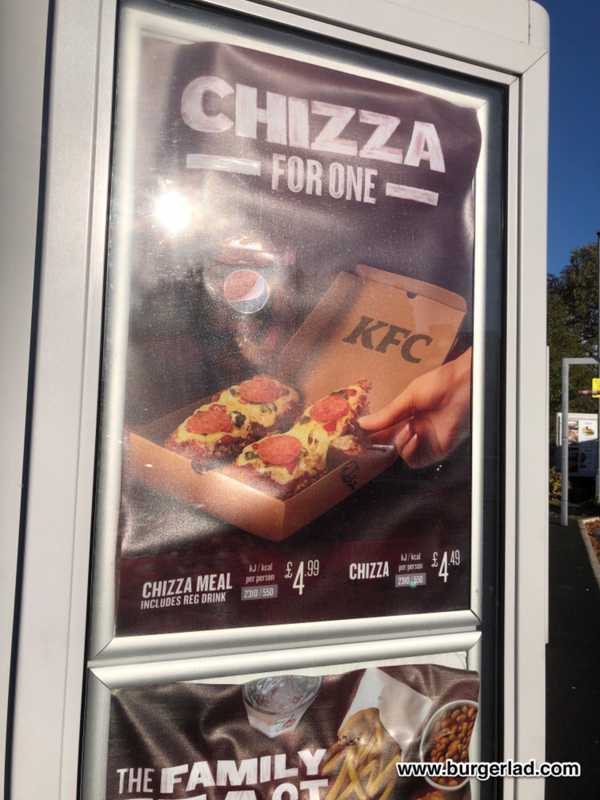 Bringing Chizza to the UK should be a clever marketing ploy to get people buzzing about the KFC brand. Perhaps BK will give us their long defunct Pizza Burger instead? As stated above, this doesn’t come with any sides but the 550 total calories make a respectable lunchtime treat. It is the kind of thing you might have a couple of times and is certainly worth sampling when you can. Chizza is a very decent, interesting special which we anticipate being available in all participating restaurants in 2019. It's CHIZZA in the UK!! !